1990 – Willy Gad Monnier, a former Tag Heuer principal, buys the Zodiac brand and modernizes all Zodiac models with a definite Tag Heuer influence and goes bankrupt in late 1997. Neuchatel watchmaker Montres Zodiac SA declared bankruptcy. The company was founded in 1888 in Le Locle, Switzerland. According to its director, financial difficulties caused the firm to close its doors. He cited unpaid deliveries, a decrease in orders and a loss of bank credit lines a the main reasons for the brands problems. The main market for Zodiac’s products was the USA. Six people have been laid off. The firm is looking for someone to take over the brand. October 2001 – Fossil Inc. purchases the Zodiac Swiss brand. Fossil AS WELL AS a letter of intent to acquire three separate companies located in Switzerland. These companies COMBINED will provide the design, sourcing and production necessary to manufacture and market Swiss-made watches. In November 2001 Fossil completed acquisition of three companies in Bienne, Switzerland. Montres Antima SA (“Antima”), Meliga Habillement Horloger SA (“Meliga”) and Synergies Horlogeres SA, (“Synergies”) providingdesign, sourcing and production capabilities necessary to manufacture and market Swiss-made watches. “we will not be moving forward with any styles from the current collection, instead we will be re-launching the brand with a new collection at the Basel Show in April 2002 with retail delivery in the Fall. All I can say at this time is that the collection will be Swiss made and will be comprised of 3 families: Classics, Sports and Fashion. Pricing and distribution to be determined..
Fossil Group, Inc. is an American designer and manufacturer of clothing and accessories, primarily watches and jewelry, but also sunglasses, wallets, handbags, belts, shoes and clothing, based in Richardson, Texas, United States. Their brands include Fossil, Relic, Abacus, Michele Watch, Skagen, and Zodiac Watches.Fossil also makes watches for brands such as Adidas, Emporio Armani, Karl Lagerfeld, Michael Kors, Marc by Marc Jacobs, Burberry, DKNY, Diesel and Armani Exchange.CEO Kosta Kartsotis own approximately 12% of Fossil stock. The company name represents the nickname the brothers had for their father. Fossil was founded in 1984 as Overseas Products International by Tom Kartsotis, a former Texas A&M University student living in Dallas from a suggestion by his older brother, Kosta Kartsotis, a merchandising executive at Sanger Harris. Kosta told his younger brother about the potential large profits that could be made in importing retail goods made in the Far East [CINA], specifically in importing moderately-priced fashion watches.Their main product was fashion watches with a retro look. In 1990, they introduced leather goods under the Fossil brand, and the Relic line of watches. In 1882, Ariste Calame founded a workshop for the production of special watches in Le Locle, Switzerland. The original name of the company was Ariste Calame and would later become Zodiac. The name “Zodiac” was used early but was not registered until 1908. The founder’s son, Louis Ariste Calame, was sent to watchmaking school, and then began to participate in the business in 1895, and took over the business that year. The first flat pocket watch was launched to the public in 1928, and used the unique Zodiac calibre 1617 movement. In 1930 the brand designed and produced the first automatic sports watch, and then produced the popular Zodiac Autographic. The Autographic was self-winding with a power reserve gauge, an unbreakable crystal, and a radium dial, and was also water and shock resistant. 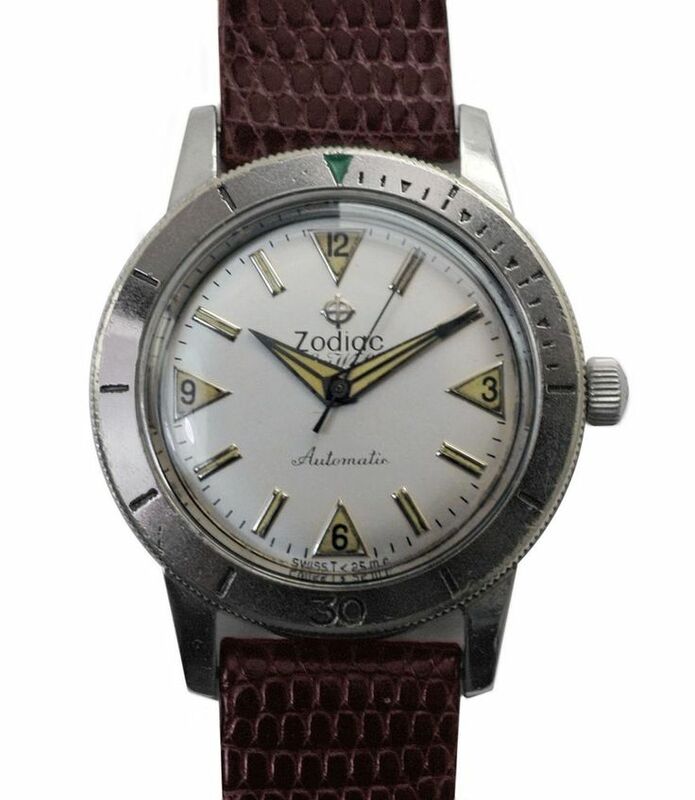 In 1953 Zodiac introduced the Sea Wolf as the world’s first purpose-built “dive watch” manufactured and marketed to the masses. To date, the original Sea Wolf, and its successor, the early-1970s Super Sea Wolf, are widely considered two of the most iconic commercial dive watches in history. With a patented crown/stem system and improved case back design, Super Sea Wolf’s water pressure rating increased from its predecessor’s 200-meter rating to 750 meters. When the 750-meter-rated Super Sea Wolf was introduced in the early 1970s, the U.S. Navy SEALs adopted it, as Zodiac announced in magazine ads of the day. In 1990 Willy Gad Monnier, formerly of TAG Heuer purchased the Zodiac brand, however this company, Montres Zodiac SA, went bankrupt in November 1997. In September 1998 Genender International, Inc. purchased the Zodiac inventory including their trademarks and registrations and other assets. Genender discontinued all of the “Point” series models, the Swiss Formulas, the Sea Wolf, and most automatic watches and all of the Zodiac automatic chronographs. The only two 1990s models kept were the Super Sea Wolf and the Marine Life, both of which were updated with new metal bands. On October 1, 2001 Fossil Inc. acquired the worldwide rights to the Zodiac brand name for approximately $4.7 million for use in connection with watches, clocks and other timekeeping devices. In April 2002, the new Zodiac line was introduced at the BaselWorld watch show in Switzerland, with the notable absence of any Sea Wolf model for the first time in 50 years. In February 2010, Fossil Inc. launched the ZMX (Zodiac Mission Extreme) line to reflect a new segment of sports and outdoor enthusiasts. The much larger case sizes (44mm and up) and caoutchouc rubber straps denoted the bulk of watch lines, focused on automotive racing (ZMX Racer), aviation (ZMX Aviator), diving (ZMX Oceanaire) and exploration (ZMX Adventurer). February 2015 marked the return of the brand’s iconic Sea Wolf model, reissuing “vintage-inspired” versions of the 1954 model in two editions, “Skin Diver” and “Diver.” Since the depth rating on the new version of the Sea Wolf are the same as the original (200 meters/660 feet), the technical advancements come primarily in the form of the watch’s automatic movement, the Fossil Group manufactured STP 1-11 (Swiss Technology Production 1-11); housing 26 jewels with 44-hour power reserve.